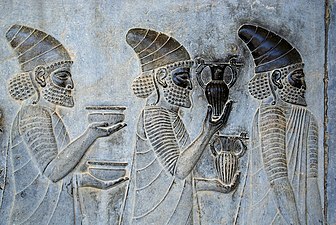 Detail of a relief on the eastern stairs of the Apadana Palace, Persepolis, depicting Armenian ambassadors, bringing wine to the Persian Emperor. The altered consciousness produced by wine has been considered religious since its origin. The ancient Greeks worshiped Dionysus or Bacchus and the Ancient Romans carried on his cult. 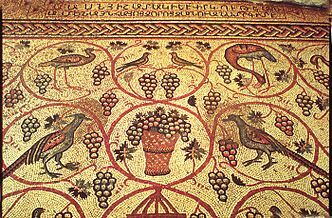 Consumption of ritual wine was part of Jewish practice since Biblical times and, as part of the eucharist commemorating Jesus's Last Supper, became even more essential to the Christian Church. 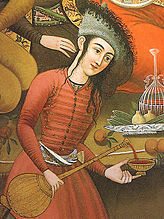 Although Islam nominally forbade the production or consumption of wine, during its Golden Age, alchemists such as Geber pioneered wine's distillation for medicinal and industrial purposes such as the production of perfume. The origins of wine predate written records, and modern archaeology is still uncertain about the details of the first cultivation of wild grapevines. It has been hypothesized that early humans climbed trees to pick berries, liked their sugary flavor, and then began collecting them. After a few days with fermentation setting in, juice at the bottom of any container would begin producing low-alcohol wine. According to this theory, things changed around 10,000–8000 BC with the transition from a nomadic to a sedentism style of living, which led to agriculture and wine domestication. Wild grapes grow in Armenia, Georgia, Azerbaijan, the northern Levant, coastal and southeastern Turkey, and northern Iran. The fermenting of strains of this wild Vitis vinifera subsp. 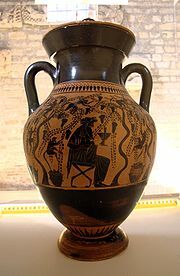 sylvestris (the ancestor of the modern wine grape, V. vinifera) would have become easier following the development of pottery during the later Neolithic, c. 11,000 BC. The earliest discovered evidence, however, dates from several millennia later. 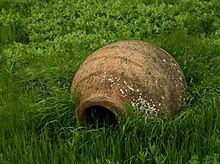 The earliest archaeological evidence of wine fermentation found has been at sites in China (c. 7000 BC), Georgia (c. 6000 BC), Iran (c. 5000 BC), Greece (c. 4500 BC), and Sicily (c. 4000 BC). The earliest evidence of steady production of wine has been found in Armenia (c. 4100 BC). 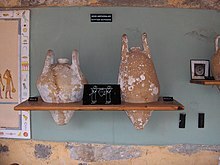 The Iranian jars contained a form of retsina, using turpentine pine resin to more effectively seal and preserve the wine and is the earliest firm evidence of wine production to date. Production spread to other sites in Greater Iran and Greek Macedonia by c. 4500 BC. 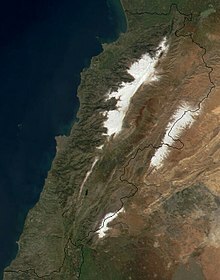 The Greek site is notable for the recovery at the site of the remnants of crushed grapes. The fame of Persian wine has been well known in ancient times. The carvings on the Audience Hall, known as Apadana Palace, in Persepolis, demonstrate soldiers of subjected nations by the Persian Empire bringing gifts to the Persian king. 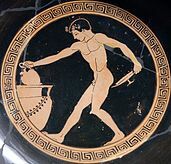 In Homeric mythology, wine is usually served in "mixing bowls" rather than consumed in an undiluted state. 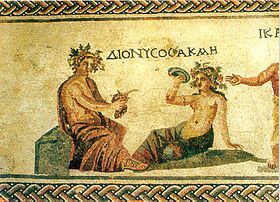 Dionysus, the Greek god of revelry and wine—frequently referred to in the works of Homer and Aesop—was sometimes given the epithet Acratophorus, "giver of unmixed wine". Homer frequently refers to the "wine-dark sea" (οἶνωψ πόντος, oīnōps póntos): in lack of a name for the color blue, the Greeks would simply refer to red wine's color. Archaeologists have discovered production from native "mountain grapes" like V. thunbergii and V. filifolia during the 1st millennium BC. 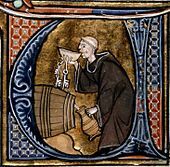 Production of beer had largely disappeared by the time of the Han dynasty, in favor of stronger drinks fermented from millet, rice, and other grains. Although these huangjiu have frequently been translated as "wine", they are typically 20% ABV and considered quite distinct from grape wine (葡萄酒) within China. ^ "UNESCO Pafos Archaeological Park". ^ Jancis Robinson; Julia Harding; Jose Vouillamoz (2013). Wine Grapes. Harper Collins. ISBN 9780062325518. ^ a b Li, Yuanbo; Bardaji, Isabel (2018). "New wine world from Asia Development, regional comparison and opportunities for the wine industry in China" (PDF). Universidad Politécnica de Madrid: 1. ^ a b Cañete, Eduardo; Chen, Jaime; Martín, Cristian; Rubio, Bartolomé (2018). Smart Winery: A Real-Time Monitoring System for Structural Health and Ullage in Fino Style Wine Casks (PDF). MDPI. p. 2. ^ a b c Castro-Sowinski, Susana (17 November 2016). Microbial Models: From Environmental to Industrial Sustainability. Springer. p. 42. ISBN 9789811025556. ^ a b c Hames, Gina (2010). Alcohol in World History. Routledge. p. 17. ISBN 9781317548706. ^ Ellsworth, Amy (18 July 2012). "7,000 Year-old Wine Jar". University of Pennsylvania Museum of Archaeology and Anthropology. ^ Tondo, Lorenzo (30 August 2017). "Traces of 6,000-year-old wine discovered in Sicilian cave". The Guardian. 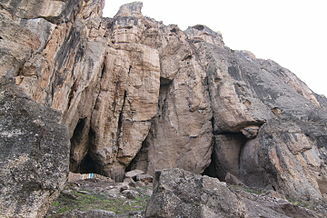 ^ a b "Earliest Known Winery Found in Armenian Cave". news.nationalgeographic.com. 12 January 2011. Retrieved 1 November 2015. ^ a b "Armenian find is 'world's oldest winery' - Decanter". Decanter. 12 January 2011. Retrieved 1 November 2015. ^ "Prehistoric plonk: World's earliest winery discovered 6,100 years after producing its last vintage". Mail Online. 11 January 2011. Retrieved 1 November 2015. ^ a b "Scientists discover 'oldest' winery in Armenian cave". edition.cnn.com. Retrieved 1 November 2015. ^ a b c Hotz, Robert Lee. "Perhaps a Red, 4,100 B.C." Wall Street Journal. ISSN 0099-9660. Retrieved 1 November 2015. ^ a b Ancient Mashed Grapes Found in Greece Archived 3 January 2008 at the Wayback Machine Discovery News. ^ Mark Berkowitz (September – October 1996). "World's Earliest Wine". Archaeology. Archaeological Institute of America. 49 (5). Retrieved 13 January 2011. ^ "6,000-year-old winery found in Armenian cave (Wired UK)". Wired UK. Archived from the original on 8 December 2015. Retrieved 1 November 2015. ^ "World's oldest winery discovered in Armenian cave". news.am. Retrieved 1 November 2015. ^ Verango, Dan (29 May 2006). 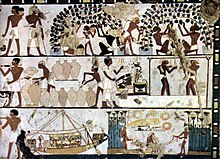 "White wine turns up in King Tutankhamen's tomb". USA Today. Retrieved 6 September 2007. 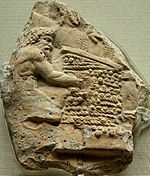 ^ a b c Wine Drinking and Making in Antiquity: Historical References on the Role of Gemstones Many classic scientists such as Al Biruni, Theophrastus, Georg Agricola, Albertus Magnus as well as newer authors such as George Frederick Kunz describe the many talismanic, medicinal uses of minerals and wine combined. ^ Schmitz, Leonhard (1867). "Acratophorus". In Smith, William (ed.). Dictionary of Greek and Roman Biography and Mythology. 1. Boston, MA. p. 14. ^ Andrew Dalby (2002). Empire of Pleasures: Luxury and Indulgence in the Roman World. Routledge. p. 136. ISBN 978-0-415-28073-0. ^ Andrew Dalby (2002). Empire of Pleasures: Luxury and Indulgence in the Roman World. Routledge. pp. 134–136. ISBN 978-0-415-28073-0. ^ Eijkhoff, P. Wine in China: its historical and contemporary developments (PDF). 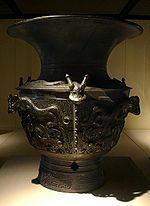 ^ Wine Production in China 3000 years ago Archived 28 August 2008 at the Wayback Machine. ^ "Zhang Qian: Opening the Silk Road". monkeytree.org. ^ Vitruvius. De architectura, I.4.2. ^ Pliny. Natural History, XIV.61. ^ "History of Wine I". Life In Italy. 28 October 2018. ^ "The Roman Wine of Speyer: The oldest Wine of the World that's still liquid". Deutsches Weininstitut. Archived from the original on 26 April 2014. Retrieved 25 April 2014. ^ "Museum scared to open ancient Roman wine". The Local - Germany edition. 9 December 2011. Retrieved 25 April 2014. ^ Rutman, Rabbi Yisrael. "Pesach: What We Eat and Why We Eat It". Project Genesis Inc. Archived from the original on 24 December 2001. Retrieved 14 April 2013. ^ Miller, Chaim. Chabad. "Rashi's Method of Biblical Commentary".